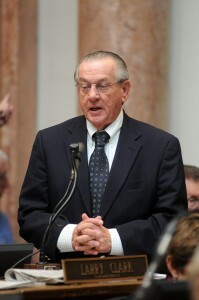 Frankfort, KY–State Rep. Larry Clark of Louisville filed legislation Friday to impose a tax on electronic cigarettes at the rate of 15 percent of the wholesale sales price, effective July 1, 2015. Rep. Clark said he hopes that House Bill 438, if approved, would act as a deterrent to young people who are often targeted by the manufacturers of e-cigarettes through marketing campaigns. “What I am also hearing from the medical community is that e-cigarettes may be worse than actual tobacco cigarettes,” Rep. Clark said. The legislation defines “electronic cigarette” as any device, regardless of shape or size that contains a heating element, battery, electronic circuit, power source, or other electronic, chemical, or mechanical means; and can be used to deliver a vapor of nicotine or any other substance to simulate smoking. The tax would apply to the actual electronic cigarette device, any vapor cartridge or container of a liquid solution intended for use with or in the device and any component of the device or a related product. Of the seven states surrounding Kentucky, Indiana, Ohio and Virginia have legislation pending to tax electronic cigarettes. Rep. Clark asked me about our surrounding states. Of our seven surrounding states, Indiana, Ohio, and Virginia have pending legislation this year to tax electronic cigarettes. States that currently tax e-cigarettes include Minnesota, at 95 percent of the wholesale price, and North Carolina, at $.05 per fluid milliliter of nicotine fluid. Larry Clark represents the 46th District in Louisville and has served in that position since 1984 and he maintains a 100% voting record. He served as the longest running House Speaker Pro Tem for 21 years, since 1993. Clark has sponsored legislation for job creation, economic development and education, and he has been a supporter of seniors and veterans. For more information, visit www.KeepLarryClark.com.